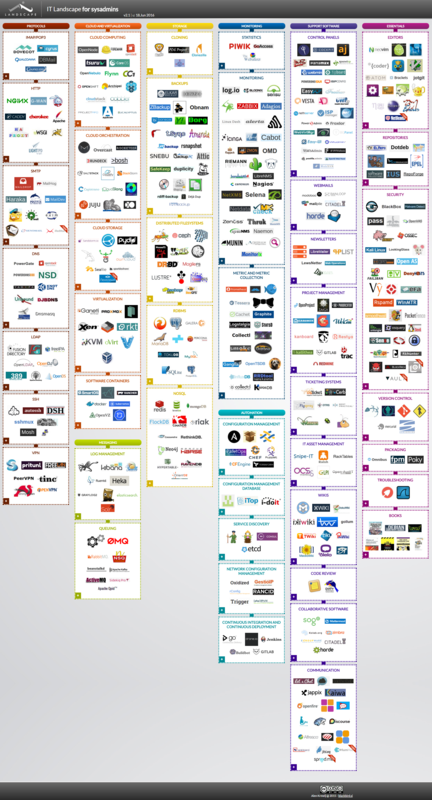 Protocols, Cloud/VM, Storage, Monitoring, Support, Messaging, Automation, and Essentials: the Complete ‘IT Landscape for SysAdmins’ in One Chart #SysAdminDay « Adafruit Industries – Makers, hackers, artists, designers and engineers! This recently-updated chart, the IT Landscape for sysadmins, includes a bunch of the tools and resources known by sysadmins around the globe – from cloud to cloning, from newsletter management to log management tools, from common protocols like HTTP to the backbone of this and other blogs using SQL, and more. If you haven’t already, hat tip your local sysadmin today – it’s a complex landscape out there and they do a lot to make it happen! Check out the full, interactive landscape chart here at sysadmin.it-landscape.info.